3.) Active inventory dropped 4.7% from September 2017. That’s the 119th month in a row to see fewer homes on the market. The drop in sales does suggest that the market is rebalancing as buyers and sellers are processing higher interest rates. Prices are still high most likely because of the lack of homes that are on the market. Of course, these numbers represent a national sample. 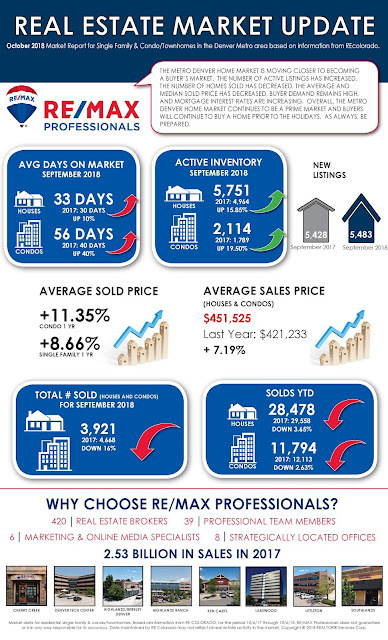 If you’re thinking about a transition or just interested in finding out what all of this means for the value of your property, I’d be happy to talk to you about our local market. - Closed dollar volume of $1.77 Billion. The Metro Denver home market is moving closer to become a Buyer’s market. 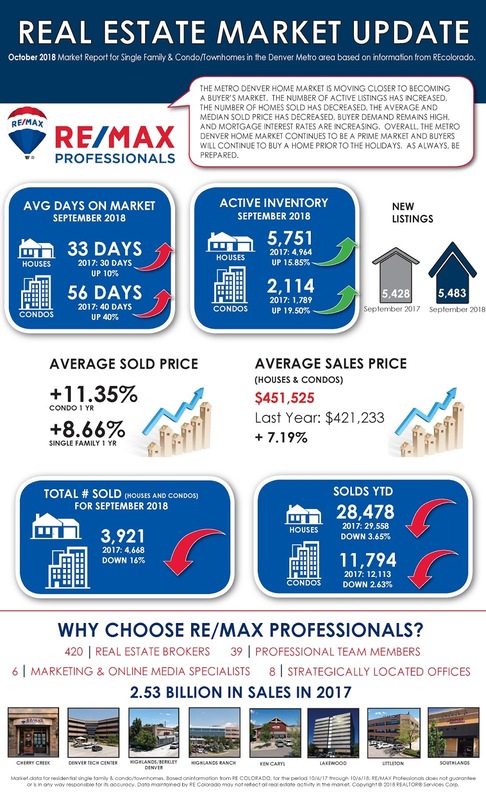 The number of active listings has increased, the number of homes sold has decreased, the average and median sold price has decreased, buyer demand remains high, and mortgage interest rates are increasing. Overall, the Metro Denver Home Market continues to be a prime market and Buyers will continue to buy a home prior to the holidays. As always, Be Prepared. The Metro Denver Seller’s home market continues slowing down. Sellers should know what is happening in the market. Active listings have increased. Buyer demand continues. Price appreciation levels are dropping. Interest rates are increasing. Homes are now taking longer to sell. Buyers always will determine what your home is worth. As a Seller, it is time to focus on home improvements that will benefit both you as the Seller and the Buyer. Always remember that as a Seller, you need to leave a great lasting home impression for all Buyers when they have been shown your home. The Denver home market is seeing a decrease in showings, fewer multiple offers, and buyers who are cognizant of the home market changes. Manage your expectations, be flexible, be civil, and accept the offer that works best for you the Seller. Seller preparation includes a good pricing comparison analysis, instructions on staging, what are the top improvements and a conversation on how the market functions. As such, the homeowner looking to sell a home needs a professional who is a local expert, knowledgeable, and can assist in the Professional plan to sell one’s home. Now is the time to reach out to a Professional. The Denver home fall market is here. 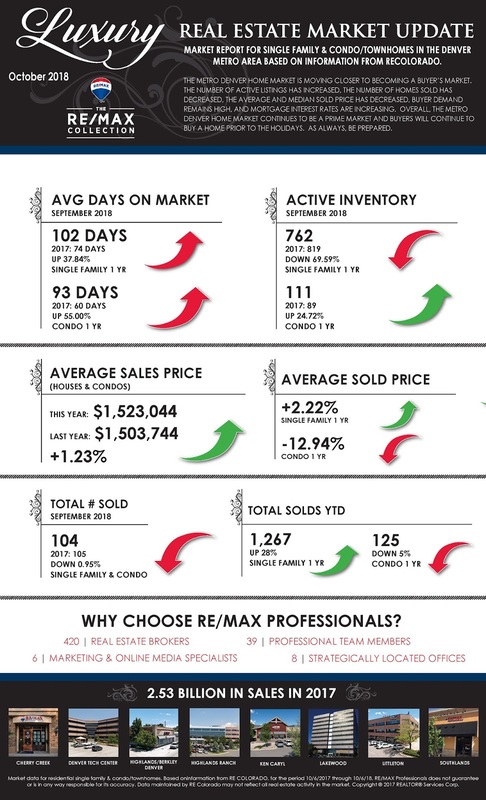 As a Buyer, know that the homes available for sale will continue to increase. As a Buyer, you will probably see that the number of Buyers will continue to be a high number. Sellers will continue to focus on the sale of their home; but, they know that the market is changing and as a Seller, they will have to consider the changes taking place in the Metro Denver Home Market. As a Buyer, make the offer that works for you and is the offer that you can complete to close the transaction. We will see a slowdown of activity; but, overall the home market will continue to be the Buyer’s destination. As a Buyer, be prepared to act quickly.